Bedford Tigers remain top of the East Premier League with just one game left to play after a vital 47-36 fight-back win at St Albans Centurions. 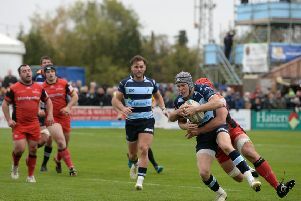 The Tigers made the trip to the impressive Coliseum ground in St Albans on Saturday knowing only a win would be good enough to keep them on top of the table. And they made an ideal start as they scored first through former Centurion Ollie Fountain. Rob Ashton converted for an early 6-0 lead. This lead proved to be short-lived, however, and the Tigers found themselves being outplayed by a side who have enjoyed a spell of very good form in recent weeks. The Tigers leaked try after try, allowing St Albans to notch up 26 unanswered points and leaving the scoreline looking decidedly bleak. If it wasn’t for Tony Moliterno rampaging his way over right on the half-time whistle, the Tigers may have felt they were out of the running. Trailing 26-10 at the interval, the Tigers came flying out of the blocks knowing they had to score first to have any foothold in the game. The forwards led the way as Sam Richbell, Karl Siudak and Gary Flook all made solid runs before Jock Marshall set Ashton up to cross the line under the posts. Ashton converted his own try to add six points to the Tigers’ tally. Alex Lovell then spotted a gap and ran through to touch down, with Jack Peachey adding the extras, and the Tigers found themselves just four points down after the first 10 minutes of the second period. But St Albans hit back and cancelled out the Tigers’ two tries with two of their own; both sweeping half-back plays putting their backs through gaps in the Tigers’ defence to reassert their lead at 36-22. With 20 minutes left on the clock the Tigers had to find something special from somewhere and they showed their character by simply not allowing St Albans to have the ball. Khrys Speed and Karl Siudak both touched down and Paul Ryder landed both goals before scoring and converting one of his own to give the Tigers the lead again. Ollie Fountain then leapt to catch a high kick and touched down for the second time, before Ryder capped the game off with a 40m drop goal with the last play of the game to secure the win. Tigers squad: Fountain, Speed, Norford, D Tribbeck, S Tribbeck, Ashton, Ryder, Siudak, Lovell, Flook, Marshall, Scott, Richbell, Strand, Murphy, Moliterno, Peachey, Foskett. Tries: Fountain (2), Moliterno, Ashton, Lovell, Siudak, Ryder, Speed. Goals: Ryder (4), Ashton (2), Peachey. MoM: Paul Ryder - Cool under pressure and created opportunities all over the pitch in the second half.